Tokyo! January 13! Nintendo Switch! 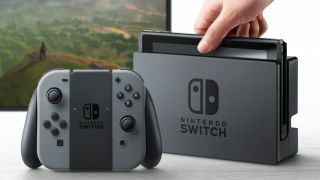 News so exciting I'm barely able to structure it into complete sentences, but yes: on January 13 we'll finally learn all the major details of Nintendo's new console, including its release date. The announcement will form the main part of Nintendo Switch Presentation 2017, described by Ninty as "a live presentation for invited media, analysts and trade partners". It'll be live-streamed online and in addition to confirming the release date, will also showcase the line-up of games currently in development. Events where media in both the US and Europe can experience the console for the first time will also take place from January onwards. Naturally, GR+ has informed its local Nintendo contact that if it isn't first in the queue, unpublishable sins will be inflicted upon Yoshi. You've all seen Se7en, right? The cold hard facts we know about the console right now are that it's landing sometime in March, and will feature a Zelda game – Breath Of The Wild, which is releasing simultaneously on Wii U and Switch. For more info, be sure to check out our reveal video in the window below.